I think this is my favorite blog name I have seen yet! Possums rule! Well, Evilsquirrel, I usually write about animals or other foolish events. Very seldom am I serious. I am currently recovering from a bite from one of my evil squirrels, so I like your name as well. I missed you and wondered what was up. Your story is wonderful and i am so happy for you, but I must admit I am looking forward to more stories about squirrels and pigs! We’re so fortunate to have had you,The Goose, both sets of your parents and your delightful children in our lives for many years (not to mention critters galore). Now we congratulate you on your charming creative writing of a heartwarming part of your life that is new to us. Thanks for the smiles and the tears. Life would be complete if the Hardy’s lived next door to me again. I loved your story. Thank you for sharing. I lovevyour writing. You need to write books. So this is the reason that the sun will not stay out for more than two days at a time! WOW – what an amazing story! I don’t usually have the attention span to read such a long post, but you had me mesmerized. This is my first visit to your blog (I’m a Bloppy too) – I will be back! So happy for you that you have more light and love in your life now. Wow. What a story. I had a very emotional reunion with my birth father. Unfortunately, mine turned out horribly. I’m so happy for you! What a story! Thanks for sharing! Here from Bloppy Bloggers. Just added you to Twitter! Wow–so happy for you all! I, too, wondered what was going on, but selfishly thought maybe you were trying to figure out a way to tell me that you weren’t going on the upcoming trip! You are coming, right???? We can leave this cold, drizzly weather behind, and put our toes in the sand for a few days! See you Sunday!!! And, really–awesome story and so glad for the happily ever after ending! I am late reading this–but I’m glad I finally did. What a beautiful story and what a wonderful family. Thank you for sharing! 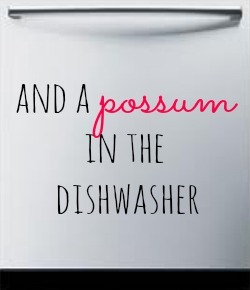 My Long and Intense Blog in Which I Reveal My Fascinating Beginnings | and a possum in the dishwasher. Is it just me or does it appear like a few of the comments come across like they are coming from brain dead folks? Thanks for reading. I don’t think anyone was brain dead, but just follow me and know that if I’m quiet, something must be up. I do post on Twitter but mostly just to the Andapossuminthedishwasher FB page. Thanks again.